Despite the fact that The Gambia has ratified the Convention on Rights of Persons with Disabilities in 2013 which specifically aimed at to ‘promote, protect and to ensure the full and equal enjoyment of all human rights and fundamental freedoms by all persons with disabilities, and to promote respect of their inherent dignity’ (article 1). There is little or nothing that has been done in changing the plight of children with disabilities. When the Convention was finally ratified, activists thought that persons with disabilities predicament have finally ended, but it is my ardent opinion that the ratification of the above Convention however does not exonerate their situation in the country. It is government fundamental and constitutional responsibility to promote and protect the rights and interest of children with disabilities in The Gambia. These obligations can also be found in plethora of laws both domestic and international such as section 31 (2) 1997 Constitution of The Gambia, section 18(1) Children’s Act 2005 and section 26(1) Women’s Act 2005; furthermore, article 7 Convention on Rights of Persons with Disabilities, article 18 (3 & 4) African Charter on Human and People’s Rights, article 23 United Nations Convention on the Rights of Child, article 13 African Charter on the Rights and Welfare of the Child etc. The failure of Gambian authorities in enforcing the above laws has culminated discrimination and marginalization against children with disabilities; and it continues rearing its ugly head in almost all public institutions promoting and protecting education. Thus, it constitutes a violation of right to education. It is a fundamental responsibility of the government in ensuring that such children are provided with facilities and mechanisms for their personal development; and are protected from all form of unreasonable discrimination and marginalization. Section 31 of the Constitution reads, “Disabled persons shall be entitled to protection against exploitation and to protection against discrimination, in particular as regards access to health services, education and employment.” This Constitutional provision should not be taken for granted because it is part and parcel of the Bill of Rights. Non-discrimination is a universal principle enshrined under the national Constitution (s 33) and other international legal instruments which have binding effect in the Gambia such as such CRPD article 3(b), CEDAW article 2, ICSCR article 2(2), ACHPR the preamble and specifically, article 18 (3) ) and CRC article 2 etc. Thus, it is apt to come with all forms of implementation mechanisms to eliminate discrimination and marginalization in the educational institutions in The Gambia in order to afford children with disabilities to have equal educational opportunities and facilities. 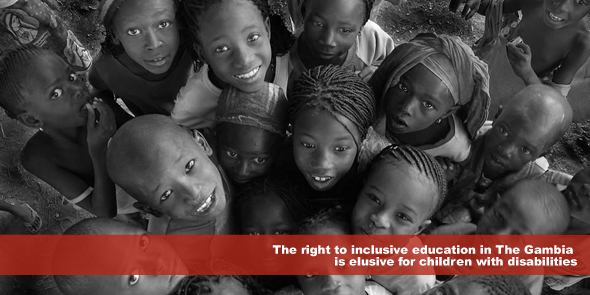 The right to inclusive education in The Gambia is elusive for children with disabilities. This is because children with disabilities continue to be denied enrolment in most public schools and some end of being untaught. It is Sad that in spite the hundreds of public schools built by the government, there is no special public school for persons with disabilities. Some of the special schools for person with disabilities in The Gambia are as a result of international donors and thus are privatized; and are only available in the urban area and leaving children with disabilities in the rural areas with difficulties to struggle for admission into public schools which is always a farfetched dream for them. The unfettered discrimination and marginalization from school authorities and of course colleague traumatisation affects their academic performance and also participation in social activities. In conclusion, considering the situation of children with disabilities in The Gambia particularly in the area of education, it is very apt for the building of special public schools for them across the country. And in fulfilling its obligations, the government should protect and guarantee everyone the right to equal and sound educational opportunities and facilities, so as to make the rights to be fully realised regardless of personal status. This will herald a dawn of a new era in the lives of persons with disabilities particularly vulnerable children in The Gambia. Sheriff Kumba Jobe (24) recently graduated from Faculty of Law at the University of The Gambia. He has a great passion for the promotion of human rights and democratisation in Africa. He is interested in doing the LLM in Human Rights and Democratisation in Africa degree and wish to work with institutions geared towards the implementation, promotion and protection of human rights.